With a level-headed voice, leading policy strategist Clarke Forsythe speaks clearly into the fray of political striving. Here he campaigns for a recovery of a rich understanding of the virtue of prudence, and for its application by policymakers and citizens to contemporary public policy. As Forsythe explains, prudence, in its classical sense, is the ability to apply wisdom to right action. In this book he explores the importance of applying the principles of prudence--taking account of limitations in a world of constraints and striving to achieve the greatest measure of justice under current circumstances--to the realm of politics, especially that of bioethics. In particular, Forsythe applies these concepts to the ongoing debate among pro-life advocates regarding gradual versus radical change as the most effective way to achieve political and legislative goals. Drawing on the Bible, philosophy, and the wisdom of historical figures such as Abraham Lincoln and William Wilberforce, he makes a strong case for a strategy of seeking to achieve the maximal change possible at a given time--or political prudence. As such, it has broad implications for political scientists and strategists both within and beyond the pro-life context. "Clarke Forsythe has written an incisive, admirably balanced analysis of the situation in which Christians now find themselves in the public square. It should serve as an authoritative guide for a long time." "Clarke Forsythe's Politics for the Greatest Good is an invaluable contribution to reflection within the pro-life movement on the best strategy to adopt in vindicating the right to life. He grounds his analysis on important historical materials, both from early American political thought and from the career of William Wilberforce, in making his case for an incremental strategy to reverse Roe v. Wade. He also provides effective critical analysis of the misguided argument that political morality requires never voting for laws that expand protection of the unborn but do not prohibit all abortions (for the time being), due to the lack of the necessary political support for broader protection. As a longtime leader in the pro-life movement who has done so much to craft and defend legal and legislative strategies to protect the right to life, he is intimately familiar with the often difficult circumstances facing those who would reestablish an American commitment to protecting all innocent human life from conception to natural death. Christians involved in pro-life work should be thankful for, and attentive to, his astute analysis and advice." "While we eagerly await the promised kingdom of God, here on earth we strive for the better that is far short of the best. This book is both a guide and an encouragement for faithful strivers." "Prudence, especially in the context of politics and the struggle for social reform, is a poorly understood, largely neglected and desperately needed virtue. We have long needed an intellectually coherent and compelling treatment of the subject. Happily, Clarke Forsythe has met the need. Drawing on the wisdom of Aristotle, Wilberforce, Lincoln, and other theorists and practitioners of political prudence, Forsythe has written a book that will both instruct and inspire all who work to protect the weak and vulnerable and to advance the cause of justice." Forsythe has written an essential book for lawmakers and all participants in the ongoing culture wars, particularly those engaging public-policy issues concerning the origins of life, the end of life, and marriage. A masterly discussion of prudence. Listed in the article Ten Theology Books for Your Beach Bag. The 2008 presidential eleection of Barack Obama, taken together with the Democratic control of the Senate and House since 2006, was a frustrating even for the pro-life movement in America. 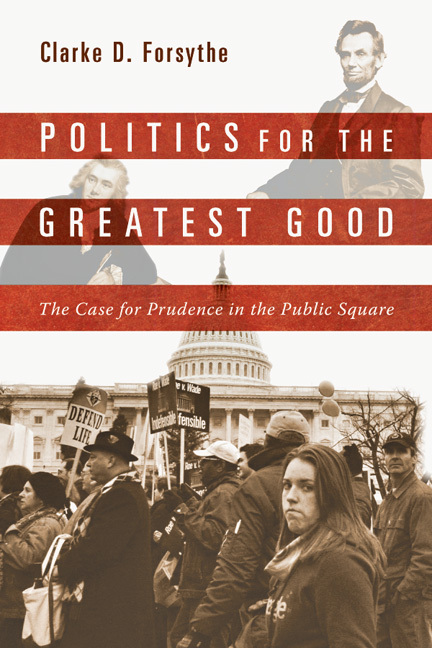 Clarke D. Forsythe wrote Politics for the Greatest Good in part to address that frustration. He is senior counsel to Americans United for Life and a leading policy strategist in the pro-life movement. But in larger part, he wrote the book to answer a nagging question: "whether it's moral or effective to achieve a partial good in politics and public policy when the ideal is not possible." He answers affirmatively, and along the way helps readers undesrtand the nature and value of prudence in the public square, espeically when it comes to enacting a pro-life legislative agenda. Introduction: Is It Immoral to be Prudent? Clarke D. Forsythe (JD Valparaiso University; MA, bioethics, Trinity International University) is a leading policy strategist in bioethical issues and senior counsel for Americans United for Life, a national pro-life public policy organization. He has argued cases before federal and state courts and has testified before Congress. He has published more than fifteen law review articles and book chapters on bioethics and the law. He has taught classes at Wheaton College, Trinity International University, and other colleges and universities, as well as spoken to audiences at Marquette University, Notre Dame Law School, Valparaiso University School of Law, and Ave Maria School of Law.